The Monster Energy Rock Allegiance music festival kicked off the beginning of the fall season when it took over Talen Energy Stadium in Chester, PA. This was the festival’s second year at the Philadelphia Union’s state of the art soccer facility, but unlike the 2015 event, this year’s festivities spanned two days from September 17 to 18. The impressive 40 band lineup included seasoned rock and roll veterans like Alice in Chains and Slayer, as well as several newcomers, including Aeges and Twelve Foot Ninjas. With such a large lineup there was plenty of variety including metal, blues, grunge, punk and everything in between. Bands performed on either one of the two side by side main stages or on the smaller side stage located just outside of the stadium. As the sun began to blaze overhead, the aroma of crab cakes, burgers, barbeque and arepas gently wafted through the air. It was early on day one, but the crowd started pouring into the festival before noon and by 11 a.m., there were lines to get into the complex. Fortunately, the lines moved quickly through security. Just inside of the main entrance were many vendors with a large variety of wares including jewelry, clothing and masks. Zippo lighters, Acid Cigars, Jack Daniels whiskey as well as others were on hand to showcase and sell their products. For budding musicians, The Music Experience had a large tent on the festival grounds where fans could test out guitars, amps, basses and other musical instruments. If you were hungry or thirsty Rock Allegiance had you covered with gourmet food trucks, many with an ethnic flair, as well as craft beers from regional breweries. Dinosaur Pileup – Click for more photos! The festivities were to begin at noon, with Dinosaur Pile-Up on the side stage. Last year’s side-stage was inside of a large tent, which gave it an uncomfortable and cramped feeling. Thankfully this year organizers ditched the tent in favor of an open outdoor stage. As a result, there was plenty of room for fans to spread out and enjoy the music. You could easily wander around to shop or eat and still hear the performances, which wasn’t necessarily the case in 2015. Saturday’s lineup was solid, with Alice in Chains headlining on the River Stage. Also performing on the main stage were The Offspring, Breaking Benjamin, The Cult, Motionless in White and Trivium, among others. The outdoor stage featured Skindred, The Apocalypse Blues Revue, LetLive and Buckcherry. Closing out the side stage was the cover band Chevy Metal, which is fronted by Foo Fighters’ drummer, Taylor Hawkins. Hawkins told the crowd, “the best thing about a cover band is that every song is great!” He was right about that. Their blistering set drew a huge crowd. Day two began much more slowly compared to day one. At a nearby hotel, fans began shuffling into the lobby for breakfast around 9 a.m. Bloodshot eyes, tussled hair and raspy voices were common that morning. Although Hundreth was scheduled to kick off the day at 11:15 a.m. on the Liberty Stage, fans took much longer to fill the festival grounds compared to day one. By lunch, it appeared attendees had rebounded from Saturday as the crowd was noticeably larger. Death Angel – Click for more photos! The day two lineup had a fantastic mix of bands on the two side by side main stages including Aeges, Twelve Foot Ninja, Sevendust, Of Mice and Men, Anthrax, Ghost, Chevelle, Avatar, Volbeat, Slayer and Avenged Sevenfold. Rocking the side stage were Death Angel, Crobot, Neck Deep, Amity Affliction and Pierce the Veil. Although the crowd was more subdued in the early part of the day, all was back mayhem and madness by the time Skindred hit the side stage at 1:20 p.m. From that point forward the intensity level of the fans rivaled day one. The cheers and screams inside of the stadium were deafening throughout the afternoon and evening. If I had to complain about anything, it would be the overlapping set times on the side stage and main stage which made it difficult to choose which artist to watch. Trying to decide between up and coming Aeges on the main stage or thrash veterans, Death Angel on the side stage was tough as both sets started at the exact same time. Although conflicting set times presents a problem for attendees, it’s a good problem to have as it’s a result of a large and deep talent pool that organizers brought together. Crobot – Click for more photos! When I reviewed last year’s Rock Allegiance event, I suggested that the only thing that could make it better was if it were two days instead of one. This year’s two-day format didn’t necessarily make the festival better, but it certainly gave fans a double dose of incredible music and more time to absorb everything the event had to offer. The big decision for next year’s show will be to keep it a two-day event or make it three. If it goes to three days, Monster Energy better create a new extra strength concoction to keep everyone on their feet on the final day. The Rock Allegiance music festival is the largest in the Philadelphia area and for the second year in a row, it was an awesome experience. The venue is superb, the food and drink options are excellent and the variety of vendors and exhibits provides something for everyone. Top that with an excellent and varied lineup of bands and you have an incredible rock and roll festival. We can’t wait to see what’s in store for next year’s event. See you there. 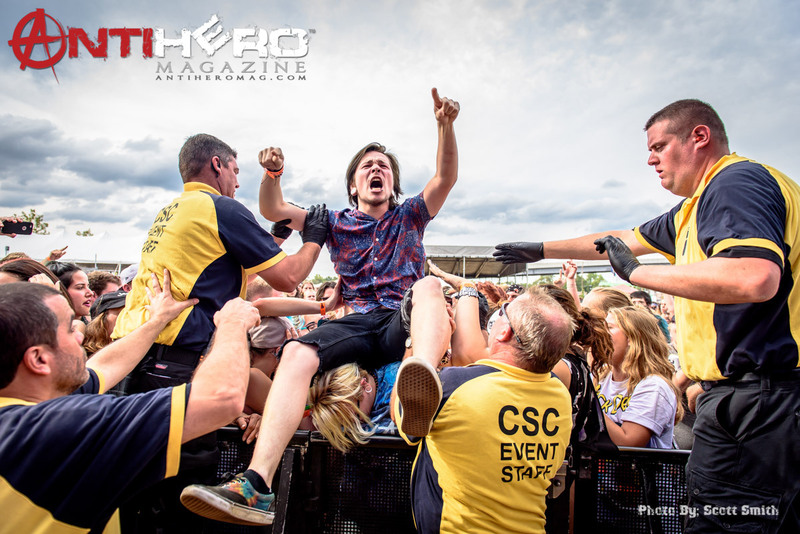 Check out all of the Rock Allegiance photos here!